Poor Tammy Norie has been sitting in the mud at Woodbridge for a few weeks since the North Sea crossing back from the Netherlands. Suddenly I have a lot of work requests from clients and very little time to sail. I’m having something of a three bus problem at work. This Saturday night there’ll be a dinner for Jester Challengers at Fox’s Marina in Ipswich. There’s a big morning high tide at Woodbridge on Saturday, pleasant weather and a fair wind, so it looks good to get off the mud at about 10:30, sail down the Deben, around the corner at Felixstowe, and up to Fox’s. Sunday is not quite so convenient. There’s a very high (4.4m) tide at Woodbridge at 00:44 on Monday, so I should be able to get back on to the dock at about 23:15, then head back to Cambridge in the morning. As usual, do let me know if you’d like to meet up or join in! I’ve just found Blueboatman’s excellent thread of junk rigged Corribee and Coromandel advice for the Jester Challenge via Steve Hickey on the Jester Challenge mailing list. This is a really useful list of failures and risks of the boat, and advice about what to do about them. What’s great is that it corresponds very closely with that I’ve observed after two years with my Coromandel thinking about the Jester Challenge. I’ve only just found this thread, and it’s great to have some confirmation as well as a few things I’ve missed. My plans for the weekend worked out well. I caught the afternoon tide out of Fareham, down to Portsmouth, then out and across to Bembridge. It turned out that the Fareham Sailing and Motor Boat Club had an organised meeting and dinner over at Island Harbour Marina on the Medina on the Isle of Wight, but I didn’t find out about it until Saturday lunch-time. I had a go at beating up towards Cowes to meet them in the morning, but it was choppy and would’ve taken many hours. The forecast for Sunday was even stronger westerlies. So I decided to reach over to Bembridge and reach back the next day. Nothing exciting happened, but then it is the Solent. 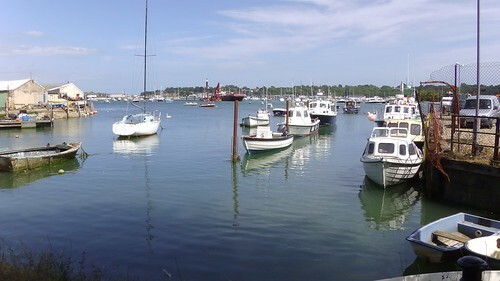 Here’s a nice picture of Bembridge Harbour. I’ve selected a few other nice ones for this album including a picture of Tammy Norie with a spinnaker at her bow. Engine hours: zero. (OK, I did run the engine for five minutes to stop the fuel gumming up and make sure it worked.) Sailed solo upwind onto the pontoon at mid tide in Bembridge in a very stiff breeze and a tight space. The two important things for me, this weekend, are (1) that Tammy is at last feeling like she’s back in one piece, with nearly everything in the right place, and ready to go, and (2) I am feeling like I’m back in one piece — able to use my left arm almost all the time without difficulty. I was told it would be one year to recover, but I think I’m 80% of the way there after six months. I think I can confidently plan some more adventurous sailing for the rest of the year. If I’m to take part in the Jester Azores Challenge in May I’d better get going!